The Lagoon 440 is probably the most comfortable Sailing Catamaran for private charter cruises.All cabins have their own bathroom offering a lot of privacy. "Calypso Phuket" has 4 double cabins. "Delight Phuket" has a very large and luxurious mastercabin plus two more spacious double cabins. Unique with this sailing catamaran is the "Flybridge". 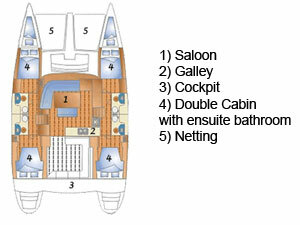 The cockpit is above the saloon, giving the guests are very nice and large outdside dining and lounging option. The indoor saloon is large and due to its large hatches very airy and nicely ventilated. The netting / trampolin area is perfect for making day and night beds to sip a drink and watch the amazing open sky.